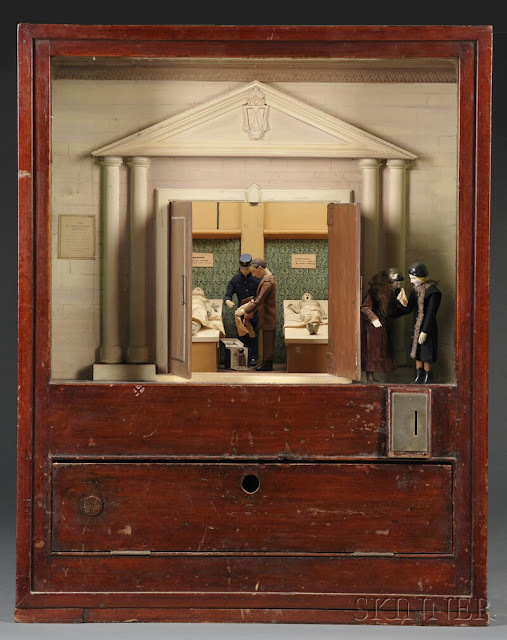 All I have to say is WOW: pictured above are scenes from a coin-operated automaton (which I am guessing is from the 1920s or 30s, rather than 1900 as the auctioneers claim) in which, after a coin is inserted, "doors open and the room is lighted revealing four morticians and four poor souls on embalming tables, the morticians move as if busily at work on their grisly task and mourners standing outside bob their heads as if sobbing in grief." "St. Dennistoun Mortuary" Coin-Operated Automaton, attributed to Leonard Lee, c. 1900, the mahogany cabinet and glazed viewing area displays a Greek Revival mortuary building with double doors and grieving mourners out front, when a coin is inserted, doors open and the room is lighted revealing four morticians and four poor souls on embalming tables, the morticians move as if busily at work on their grisly task and mourners standing outside bob their heads as if sobbing in grief, ht. 30 1/2, wd. 24, dp. 17 1/4 in. You can find out more and see the other lots--which include other automatons including an amazing automaton last supper!--by clicking here. My only plea, if any of you Morbid Anatomy readers purchase this, please (please!) invite me over to see it in action! I would certainly buy it myself if I could afford it. If the Musée Mécanique is still actively collecting, this would make a wonderful addition to their rich collection of coin-op toys depicting deaths by such means as guillotine, French execution, and English execution; yes, really. More on that here. Thanks so much to Morbid Anatomy readers Nanette Rod and Jane Fuller for bringing this amazing object to my attention! All images sourced from the auctioneer website; click on images to see larger versions. The womens' dresses definitely look like late 20s/30s. What an amazing piece! 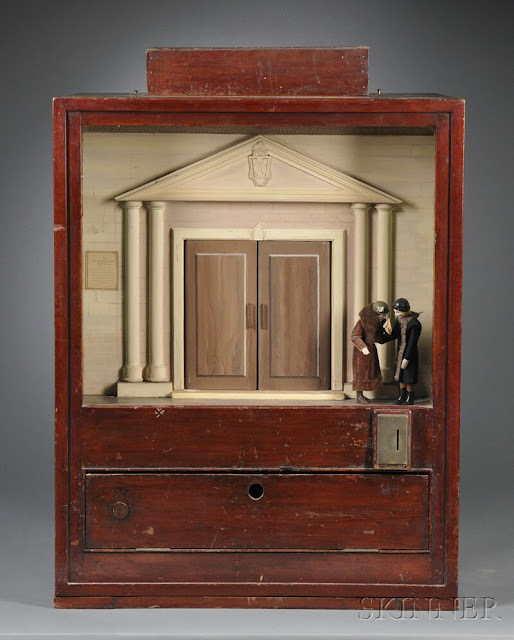 Thank you for the description of the automaton being offered at auction on Saturday. We've posted a video of the amazing automaton in action: www.skinnerinc.com/blog/2012/05/watch-a-video-of-a-macabre-automaton-st-dennistoun-mortuary.php. Amazing piece - thanks for bringing it to your reader's attention. 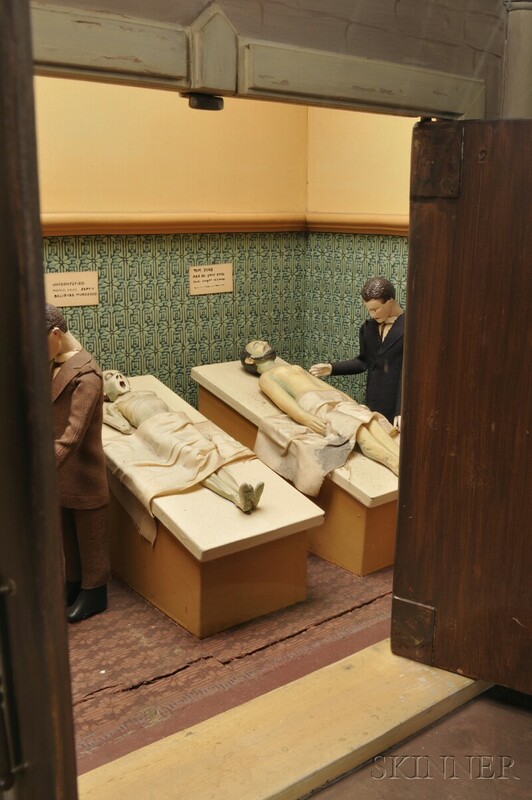 My only objection is to the dating of this automaton... 1900 seems too early given the '20s style clothing of the mourners. Looks like it went for $13,000! This is beautiful. 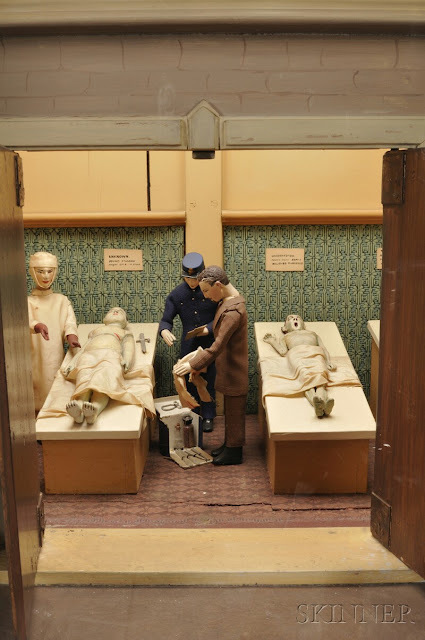 It reminds me of the days when I used to work in a mortuary, down in Denver. Those were the nice, quiet days.